Please join us for our final two events in the 2018-2019 Queer Camaraderie Series. Samiya Bashir is an African-American/Somali-American poet and author. Bashir teaches creative writing at Reed College and is the author of the groundbreaking poetry collections _Field Theories_, _Gospel_, and _Where the Apple Falls_. She is also the editor of the anthology _Best Black Women's Erotica II_. Bashir's work wends its waythrough quantum mechanics, chicken wings and Newports, love and a shoulder’s chill, melding blackbody theory (idealized perfect absorption, as opposed to the whitebody’s idealized reflection) with real live Black bodies in poems that span lyric, narrative, dramatic, and multi-media experience, engaging their containers while pushing against their constraints. Part 1 Thursday event is in GWB 2.206, this is an ADA accessible building. 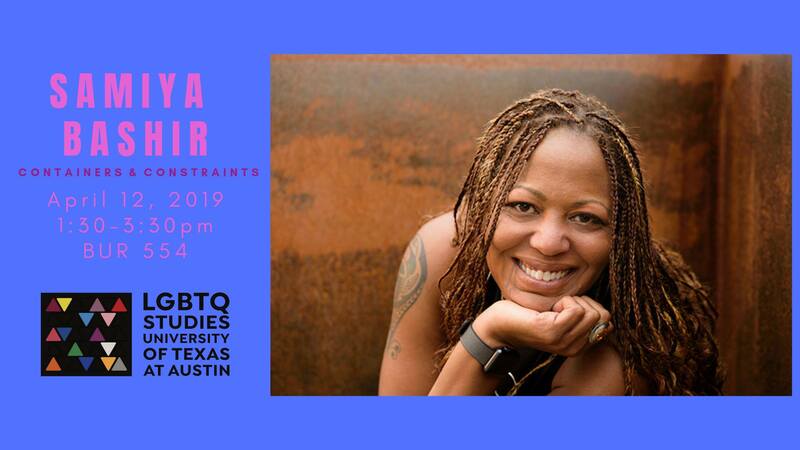 Austin's own Nia KB will open, with Lisa Lynne Moore as host. You can also join us for PART 2: Samiya Bashir: Containers and Constraints on Friday!